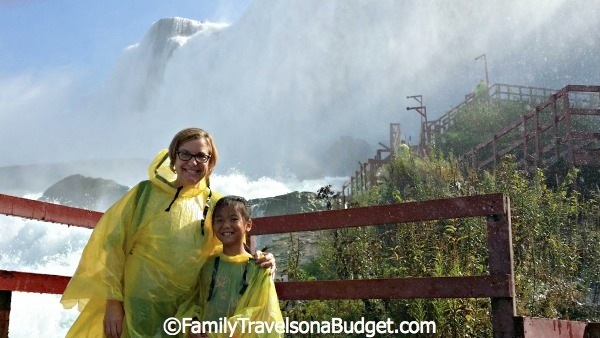 Ellie and I received complimentary Niagara USA Discovery Passes for purposes of this review. All opinions are ours. 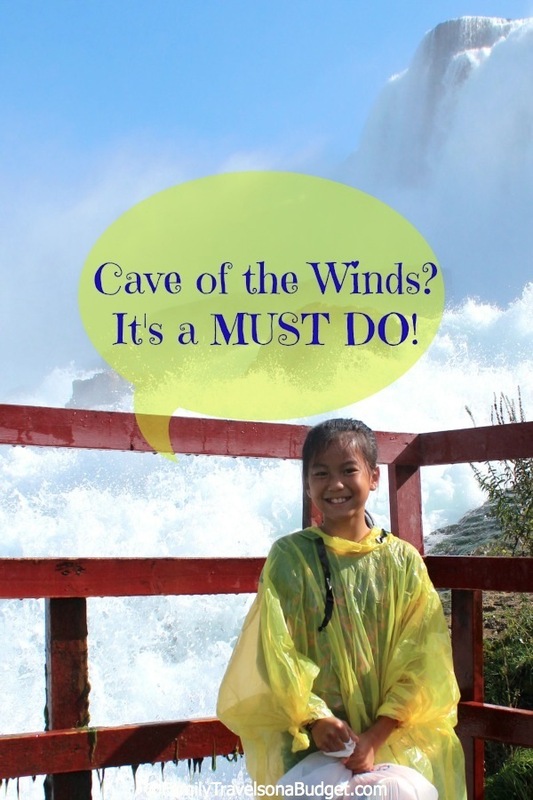 When visiting Niagara Falls with kids, especially the adventurous, Cave of the Winds is a MUST DO! The attraction, located on Goat Island in Niagara Falls State Park, is open May through October from 9:00 a.m. to 7:30 p.m. Honestly, you get so wet you wouldn’t want to visit in colder weather, AND…. they take the stairs down during the harsh winter months for the sake of safety. Why is Cave of the Winds a MUST DO attraction? As you may know, I don’t often label attractions as MUST DO activities. While I think most every attraction across this great world will appeal to someone, Cave of the Winds is a rare experience for everyone who is physically able to climb the stairs. After purchasing tickets (if you aren’t using a Niagara USA Discovery Pass), head into the area just left of the ticket window to get sandals specially made for Cave of the Winds. Change into the sandals and, if wearing long pants, roll them up as high as you can. On my visit, a sweet lady who spoke no English clearly communicated to me that my cuffed jeans were not high enough. She insisted they be above the knee. Honestly, shorts are better. Your tour begins with a long elevator ride 175 down through the rock into Niagara Gorge, the basin of the falls. Before ascending the stairs into the mist, get your recyclable, yellow ponchos to “help” stay dry. The first part of the journey is fairly tame, an easy staircase down to a lower platform to observe the falls. I especially liked watching the water crash among the rocks — such power. Take your time, though, and notice the little streams that meander quietly through the rocks without making a showy display. There’s just something about that gentle movement among the chaos that is mesmerizing. Like the Maid of the Mist, there’s not much opportunity to take good photos without risking damage to non-waterproof equipment, but on this lower deck, it can be done if the wind is fairly calm. Don’t forget to turn around and enjoy the view of the gorge from down here. It’s incredible. The next main area is the Hurricane Deck, just feet away from the plunging Bridal Veil Falls. This deck has rubberized mats, necessary to help guests maintain their balance as the water pounds, creating powerful wind gusts. I was carrying my good camera (in a camera bag) under my poncho and didn’t want to risk it getting drenched so I only “played” on this deck for a few minutes. It was, by far, Ellie’s favorite spot at Niagara Falls. I could hear her squeals of delight over the pounding surf. She wasn’t the only one, “kids” of all ages enjoyed the Hurricane Deck. To feel the pounding water and hear the roar as it broke over the rocks was simply incredible. 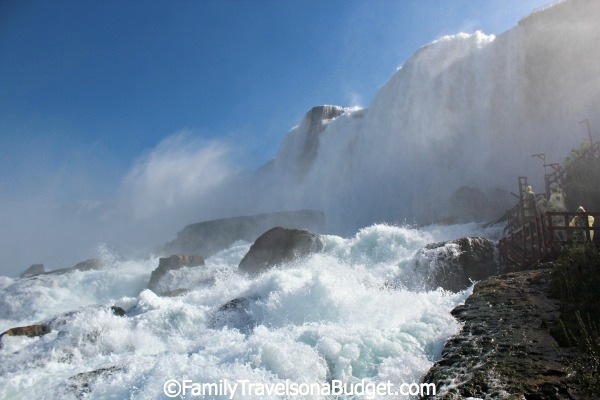 It’s the best place in all of Niagara Falls to experience the power of the Falls. Cave of the Winds is not a cave! 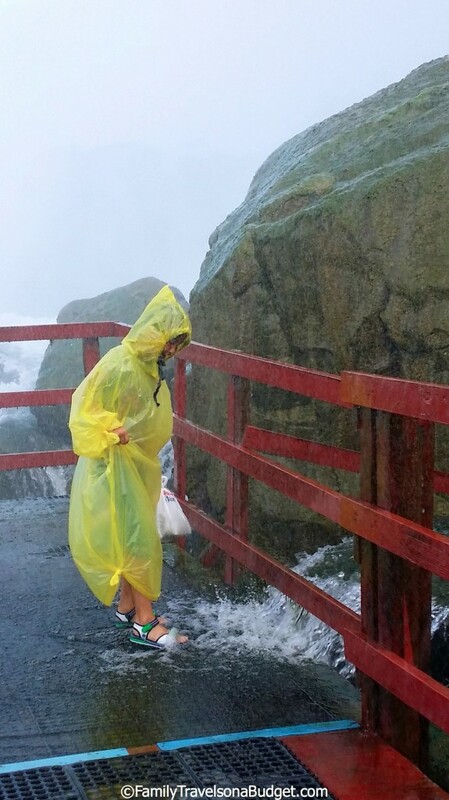 Cave of the Winds is a wet attraction…. it’s a really wet attraction, and there is no way you will stay dry. With that clearly stated, I highly recommend that you consider the outside temperature when visiting. When Ellie and I visited, the temperature was about 72 degrees fahrenheit, which was just fine. If you go when it’s colder, consider wearing a lined, waterproof jacket and take a change of clothes! I didn’t pack towels or a waterproof camera, but I recommend both for this attraction. Don’t rush the experience. 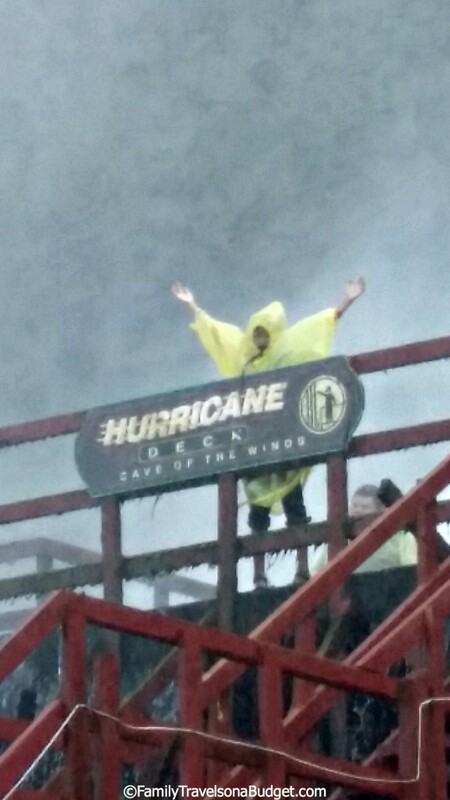 My daughter had so much fun on the Hurricane Deck. I just couldn’t pull her away and ruin the fun, especially when she started splashing in the puddles. How often do kids get to stand in hurricane gale winds safely? If I didn’t have my camera, I would have joined her for more fun. Guets with mobility and balance issues should not climb the stairs at Cave of the Winds. Also, very young children might be scared by the noise of the falls — and they should have an adult with them at all times. If they are scared, parents/family can take turns exploring Cave of the Winds. There is ample space to watch from a safe distance. Cave of the Winds full-admission prices for 2014 are $12/adults and $6/ages 6-12. 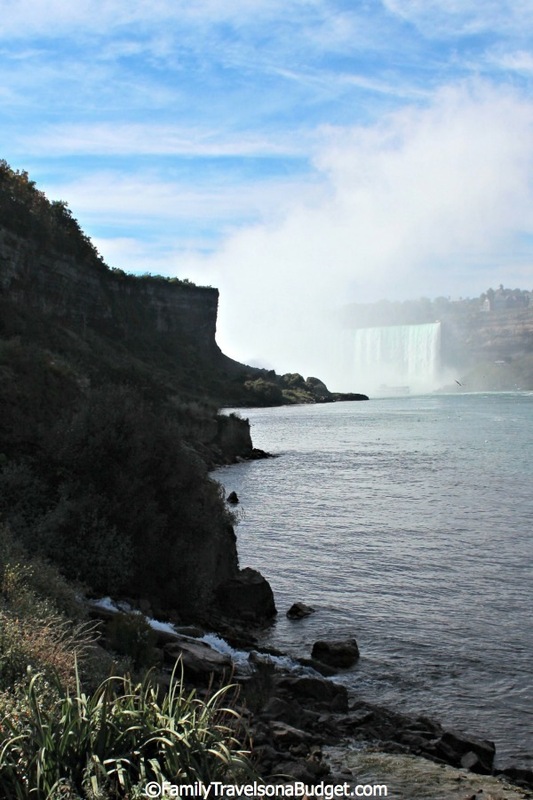 Off-season pricing, which offers a view of the falls from Niagara Gorge, but not the chance to experience the full force of the water, is discounted between November and May. I cannot say whether it’s a good value off-season. Parking at Goat Island is $8/vehicle. 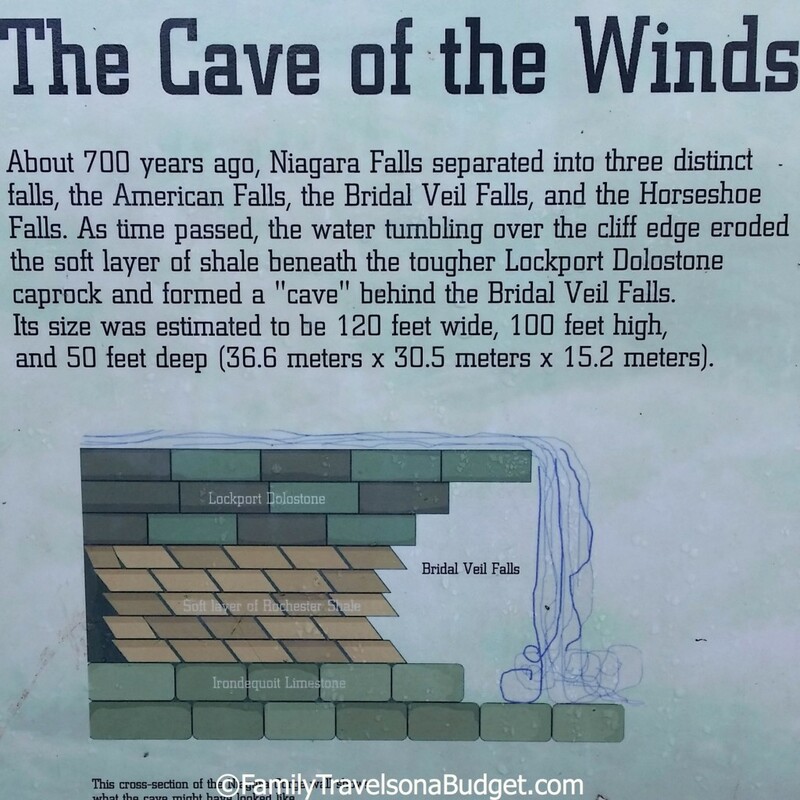 Cave of the Winds is included in the Niagara USA Discovery Pass which is $36/adults and $29/kids ages 6-12. Regular season hours are 9:00 a.m. to 7:30 p.m. daily. Travel writing… before the story!